Hiro (Kyoto, Japan) on 26 September 2016 in Plant & Nature. You know cherry usually blooms only in spring. But it can bloom in autumn. It is called 狂い咲き kurui-zaki in Japanese, it literally means crazy blooming. Insect damage by hyphantria cunea is said to be one of its cause. Superb capture and beautiful composition! Sweet presentation of this lovely moment . .
Two seasons in one photo, a beautiful scene. This is a superb image, the butterfly in this shot is wonderful. Very beautiful crazy blooming ! 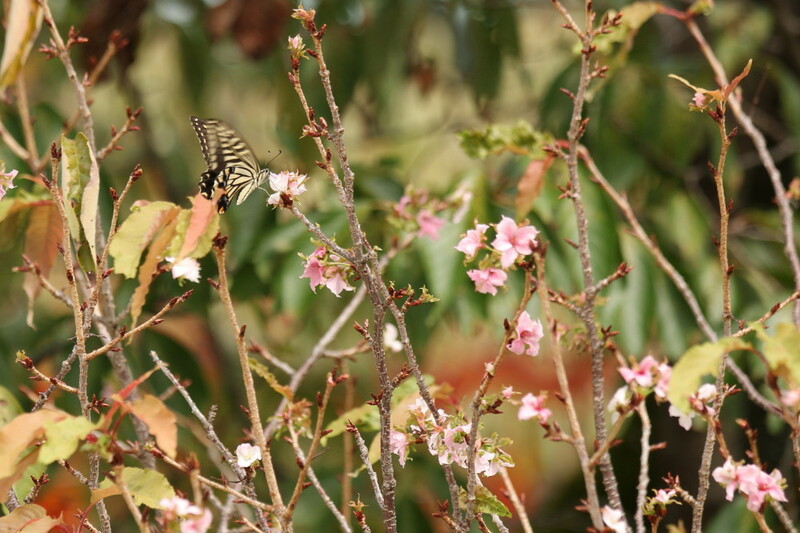 The butterfly enjoys the strange blooming season. A lovely shot. beautiful butterfly and indeed strange blooming for the period. Interesting information on this cherry blossom in autumn. Great capture of the fluttering swallowtail as well. Wow,I like to see them. Two wonderful things at the same time. Nice little butterfly. Thanks for the caption.